Well folks not only have I dropped the ball on keeping you up with what we have been doing…this is the second time I have done this. I have no idea where the first one ended up. So..here we go!! 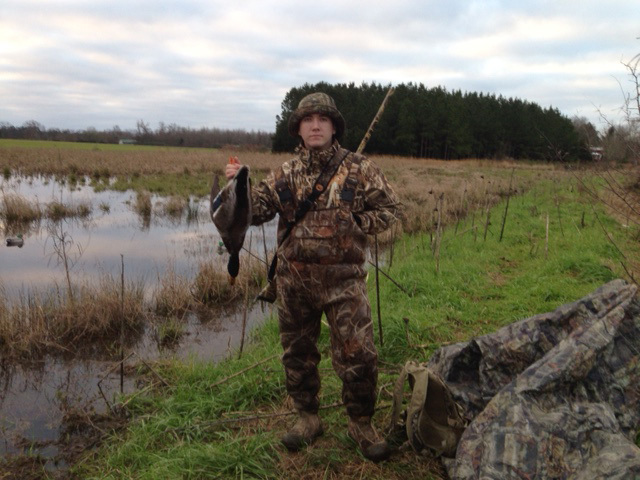 IN January we had another active duty AIRFORCE AIRMAN on a duck hunt and he bagged a Mallard Drake. Check out Seth with his trophy!! Also in January we were off to the SHOT SHOW. Folks we had seven of our volunteer staff to attend and we all paid our own way. No foundation money was spent on the trip!! 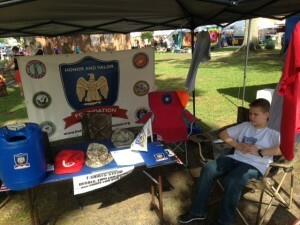 We worked hard seeking sponsors, making contacts and telling the folks about HONOR AND VALOR FOUNDATION!! Thank you to each one of our volunteers for what you do!! In FEB. we attended the VVA meeting in Whiteville and received another donation from the VETS. They have supported us from the get go and we support them also, we are in this together!! VP Larry went to visit the folks in NASHVILLE,TENN. 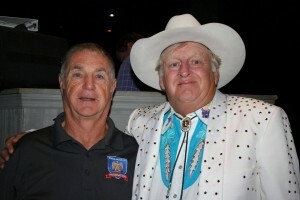 He meet with DEAN founder of the MUSIC CITY HAYRIDE. Dean is a VET and his organization is a 501c3 also!! We will be back later this summer to work on more projects!! Also in Feb outfitter JAMIE made a trip to ARKANSAS to line up pits for our DUCK HUNTS this year. To close out the month outfitter ROY and Larry went on a Snow Goose hunt in ELIZABETH CITY, NC. We got a few geese but our biggest trophy was meeting Roy’s cousin JASON. Jason is a diehard fisherman and golfer. After meeting us and learning what the foundation is doing he said “I’M IN”!! The month of March we were busy getting our Dove field ready to plant. Disking fertilizing and planting!! 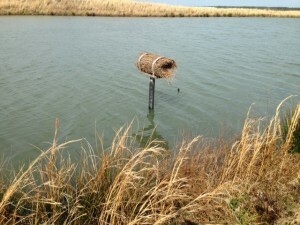 Vet PAT and Larry also put up 3 wood duck boxes and 3 DELTA HEN HOUSES. 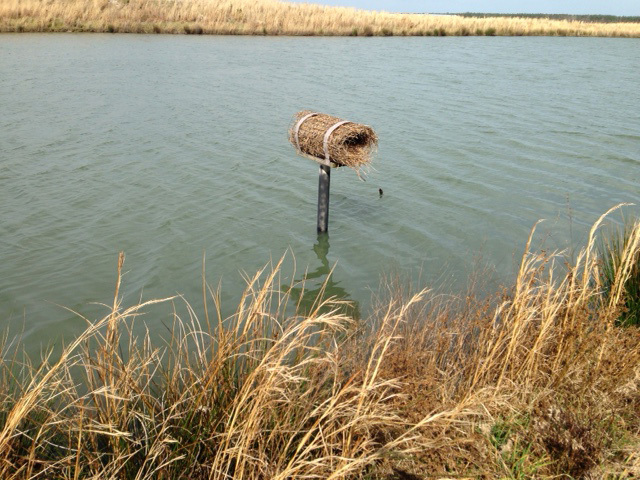 We also turned the water off the impoundment in march. It took 16 days to dry out and get it ready to disk and spray!! IN APRIL ANDY and Larry had the pleasure of taking VET VAUGN out to a SEA FOOD dinner at DALES!! We planted our SUN FLOWERS in April. 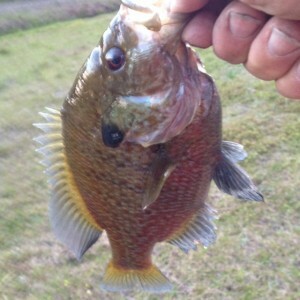 We also did some fishing in Sonny’s pond to get some idea of what was in there. The pond is several years old and has never been fished. WE got fish!! This Grass Perch was caught and released! In May Jason put together a BASS Fishing trip for 2 Vet on MEMORAL DAY WEEKEND. Larry and our film crew, Vet CHRIS and Mark made the three hour trip to Lexington NC. WE had a great day, caught fish and got some great footage!! Vietnam VET TOMMY and MARINE VET thank you for your service and allowing us to take you fishing!! JASON put on a FIRST CLASS VENUE!! SALUTE!! It’s JUNE and the SUN FLOWERS are up and we are planting the impoundment with corn!! Sunny is having his pond increased in size..will be around 10 acres!! Also in June we attended the BLUE BERRY FESTIVAL in Burgaw,NC. We spoke to a lot of Vets and told the folks about what we do!! July—Andy and Larry went to DC and meet with JERI who is from that area and is willing to help us out. She is a super sales lady..THANKS MA’AM!! Now some may be asking why so much time spent on hunting and fishing. We are close to CAMP LEJUNE and FORT BRAGG. We want to bring active duty and VETS with their children to enjoy the outdoors. Remember folks we do as often as our budget allows. Honor And Valor Foundation has no paid employees. If you would like to help us check out the AMAZON SMILE PROGRAM! If you are a BIKER do a ride for us! Get on board>>You will like what we do…until next time>>CARRY ON! !